According to police, Lobos sniffed out 12.2 kilos of methamphetamine! FAYETTE COUNTY -- Our favorite K-9 and crime stopper, Lobos, has saved the day again! The Fayette County Sheriff's Office K-9 sniffed out $1.2 million in methamphetamine while on duty with Sgt. Randy Thumann. According to the sheriff's office, Sgt. 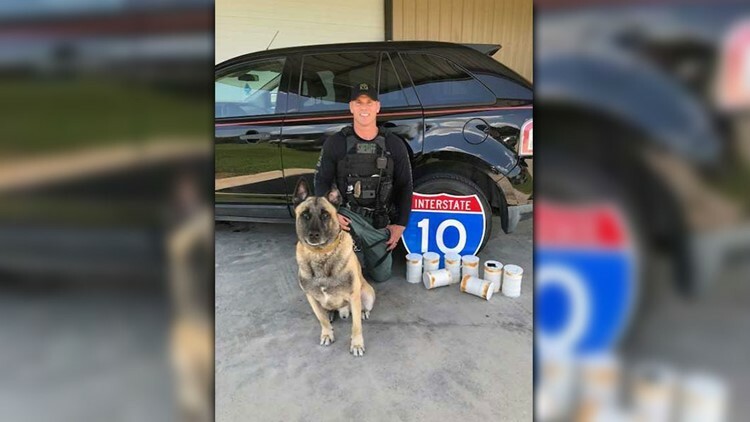 Thumann and his K-9 partner conducted a traffic stop on eastbound Interstate 10 for a traffic violation. While searching the vehicle, Lobos alerted Sgt. Thumann to the car and found eight sealed PVC containers in the fuel tank, police said. Deputies said 12.2 kilos of methamphetamine -- which has an estimated street value of $1.2 million -- were found in the PVC containers. Benjamin Ruiz Jr., 47, and Linda Monica Ruiz, 39, of Laredo were arrested, according to the sheriff's office. The two have been charged with possession of a controlled substance.